Where can I Hold Koala Bears and Take Pictures? Also what about touching a kangaroo and have photos taken? Is it cheaper to rent a car via internet of just hire a car when I reach coolangatta airport? There are a few places on the Gold Coast where you can hold a koala and have photos taken. All are structured and charge a fee for holding a koala and having a photo taken. 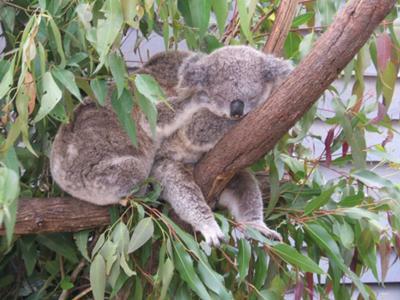 There are strict requirements so that the koalas are not stressed out. For example the koalas are only allowed to be held for no more than 30 minutes per day. The keepers make sure that they are not stressed and do not spend a second longer than they are allowed. So you have to be calm and relaxed and if this happens part way through your session, you have to accept it whilst they bring in a new koala. The two main places on the Gold Coast where I recommend having your photo taken with a koala are: Dreamworld attractions called Australian Wildlife Experience and the other is Currumbin Wildlife Sanctuary. Personally, I would pick Currumbin because you get the best of both worlds, you can cuddle a koala and feed kangaroos. With the kangaroos you can actually feed, pat and touch kangaroos and take your own photos. Currumbin Wildlife Sanctuary is about 5 minutes drive from Coolangatta airport and about 25 to 30 minutes by car from Surfers Paradise. It is a great day out, you can watch the bird feeding, there are lots of shows that highlight other animals and you can get photo taken with those animals after the show. You can see lots of other Australian native animals. There are various feeding sessions during the day. Once my daughters got to feed crickets to the freshwater crocodiles! I would not take my chances of picking up a car at the airport when you arrive. If they actually have a car, you may have to pay a premium. My personal recommendations is to check out a car hire comparison tool. I use this myself when I travel or hire a car here. Sometimes you can get a good deal from the airport other times you might get a better deal at Surfers Paradise. The advantage of picking up at the airport if you can is that you then don't have additional fees for transfers to your accommodation. If you are not sure of the area, I recommend you get a GPS for the car when you hire it as it can really save a lot of bother with trying to have a passenger map read for you in a strange place! I always book my cars before I arrive somewhere, because you can lock in the price and you know you have transport. A car is really useful on a short trip when you are trying to fit lots of things in, it gives you flexibility. There is free parking across the road from Currumbin Wildlife Sanctuary and also at Dreamworld if you choose to go there. I hope that gives you some ideas, if you have any more questions or want any more suggestions please leave a comment below or use the contact form to contact me directly. Comments for Where can I Hold Koala Bears and Take Pictures? Australian Zoo or Wildlife Sanctuary? Can we cuddle Koala and feed Kangaroo in Australian Zoo? I want to choose either Australian Zoo or Wildlife Sanctuary. I will be going to Gold Coast November 2010 and just want to plan head o that I can manage the time and cost. I have to say that your page saved my day. I am so proud of your afford and really thankful for all your valuable info. When I went to Australia Zoo you could cuddle a koala (in the photography studio). You pose for a photo whilst sort of holding/cuddling the koala. There were kangaroos out on one of the grass areas and you could buy food to feed them. So yes, both options offer you chance to cuddle koala and feed kangas!! Australia Zoo is a bit further away from Gold Coast - it is a good 2 hours by car or coach. Currumbin is in southern part of Gold Coast, close to Coolangatta and the airport and about 30 minutes from Surfers Paradise. Join in and write your own page! It's easy to do. How? Simply click here to return to Currumbin Wildlife Sanctuary Q & A.